Pump-action "springer" with camera and innovative clip. 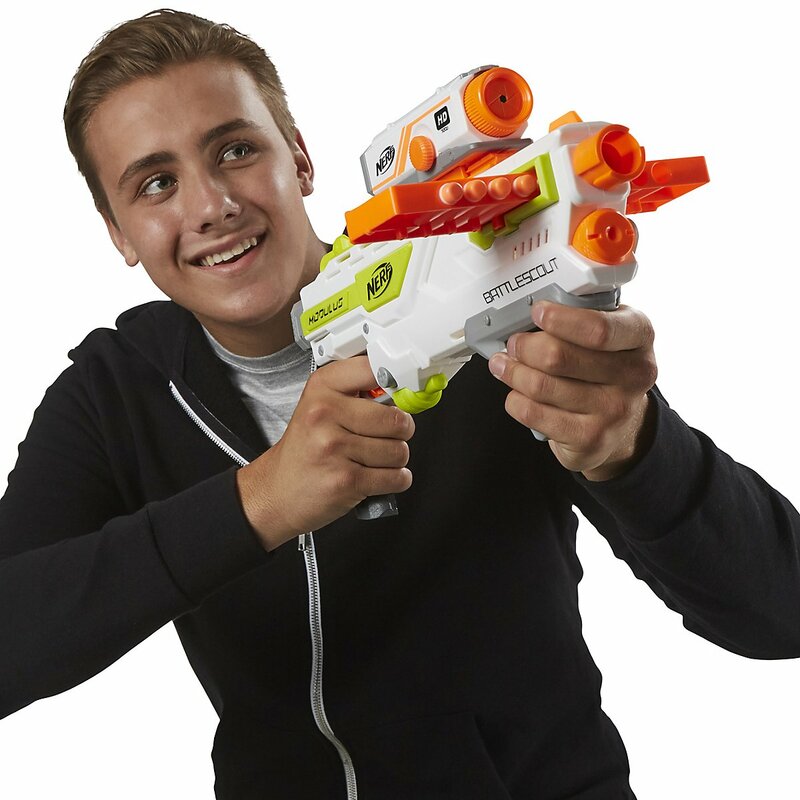 Describing the Nerf Battle Modulus Scout, it is hard to decide what to tell first. 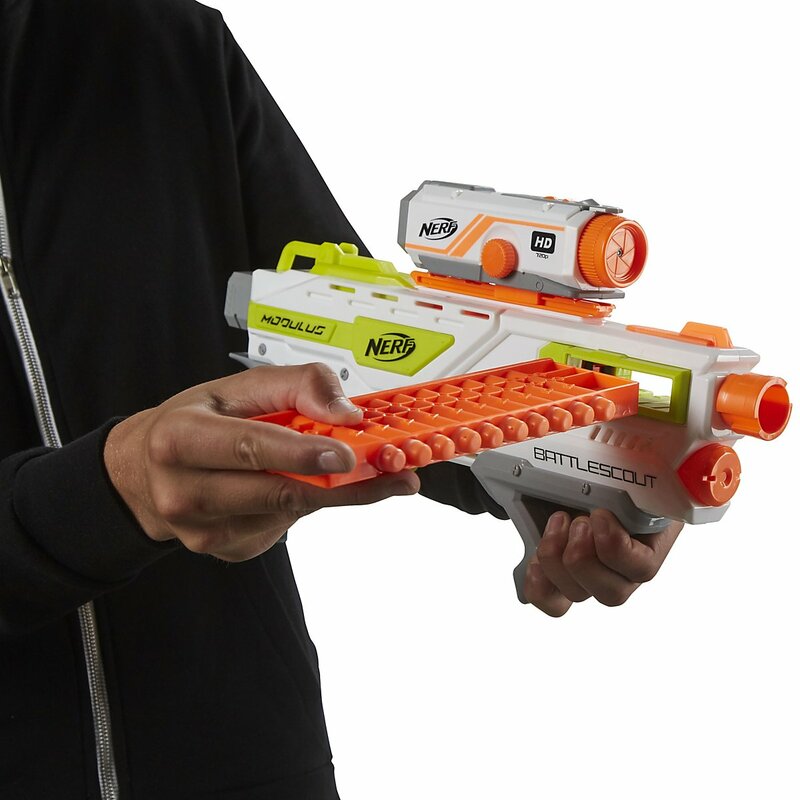 Both the reloading mechanism and the included camera are very interesting and make the blaster one of the highlights of the Nerf year 2016 and a successful add-on for the N-Strike Modulus series. Unlike previous Nerf cameras the Modulus Battle Scout comes with genuine 720p quality. 4 AA batteries and an SD card are required to shoot the next battle footage: wether to record the best actions, for analysis or simply as video evidence: mounted firmly on the Tactical Rail, nothing escapes the watchful camera eye anymore. Since the camera is not integrated into the blaster, but was designed as an accessory, it can also be fitted on other blasters that have an accessory rail. The abbreviation ICS in the name stands for Integrated Clip System, so the clip is integrated inside the blaster. 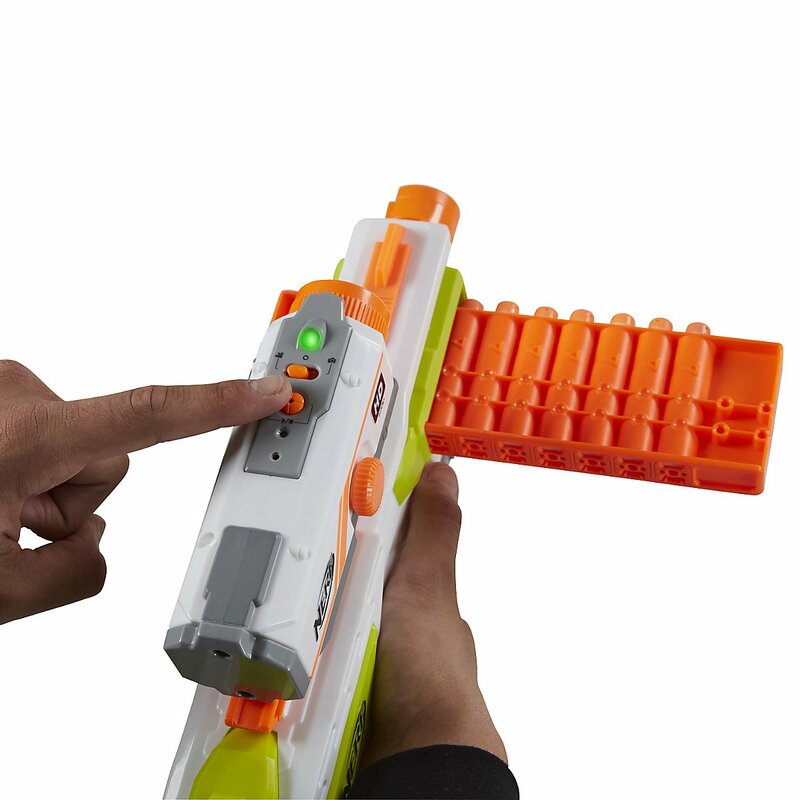 When priming the blaster, the clip moves one position further through the blaster while shooting until it comes out on the other side. The clip is not only used to provide a steady flow of darts, but also as a chamber for the darts: Darts do not sit loose in the clip, but each dart is stuck in a tube in the clip from which it is shot. The angled foregrip, with which the Blaster is primed, ensures ease of operation and makes the Blaster very comfortable to wear, especially if it is also equipped with a shoulder stock. In addition to the connection for shoulder stocks there is a barrel extension adapter and a Tactical Rail, so that optional accessory can be installed to customize the Blaster.